Today there is no economic news in Switzerland to affect USDCHF but there would be nation’s producer & import prices data for April which will be released next week. After yesterday rally this pair is expected to trade in higher ranges. 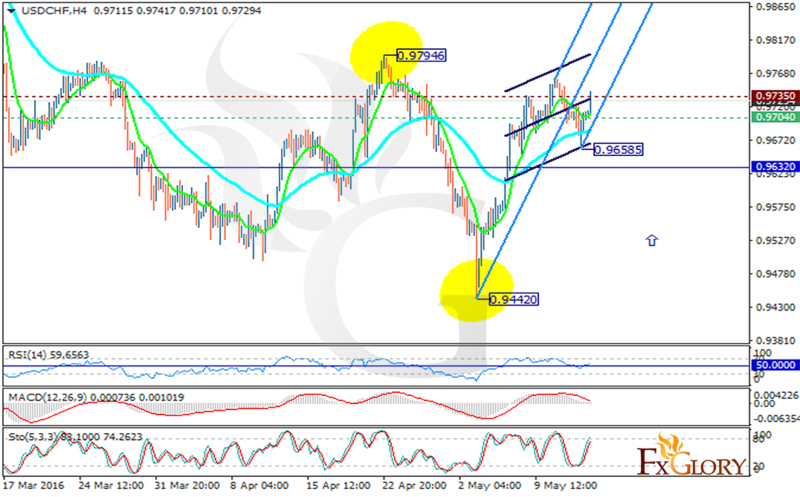 The support lies at 0.97040 with resistance at 0.97350 which both lines are above the weekly pivot point at 0.96320. The EMA of 10 is located above the EMA of 50 showing the current price movement in higher levels. The MACD indicator is in positive territory signaling the price growth and the RSI is getting close to the 50 level. The stochastic is confirming the bullish scenario as well. It seems that the pair is climbing within the Andrews’ pitchfork. Long positions are recommended with the target at 0.9735.